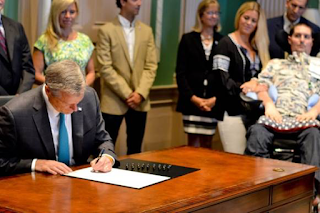 BOSTON – Governor Charlie Baker and Lt. Governor Karyn Polito today joined Senator Joan Lovely, Representative Jerry Parisella, Pete Frates, members of the Frates family and ALS research advocates for the ceremonial bill signing of H.1697, An Act Establishing The First Week In August As Ice Bucket Challenge Week, to annually honor the contributions of Pete Frates and his family and raise awareness and resources for those battling Amyotrophic Lateral Sclerosis (ALS). Governor Baker officially signed the legislation on August 1, 2017. The ALS Ice Bucket Challenge was co-founded in 2014 by Pete Frates, Pat Quinn and Anthony Senerchia to raise awareness for the progressive neurodegenerative disease and funds to support research towards a cure. In August of 2015, Governor Baker and Lt. Governor Polito were joined by Pete Frates and his family to take the ALS “Every August Until a Cure” Ice Bucket Challenge at the State House. Members of the Baker-Polito Administration, Treasurer Goldberg, Auditor Bump and members of the legislature also participated to raise awareness and support a cure for ALS.